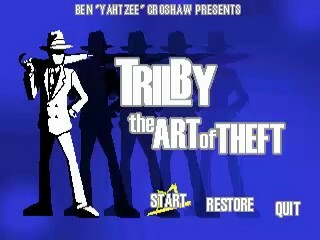 Based in the "Yahtzee"verse, technically the fifth Trilby series game, The Art of Theft was born out of its author's desire to expand his ludological vocabulary into gameplay-focused territory after all those adventure games. His only platformer before it was 1213 which this game shares the engine with. In The Art of Theft you are led through seven increasingly challenging heists, picking up loot in homes, libraries, and wherever the story takes you, all the while collecting clues about what an evil New World corporation has planned for you. So, here we are, some time later, and I have a run. It's not a perfect one, because... it never is a perfect run, BUT, the strategies and routes have been improved (to I think the point, where they can't be improved anymore. Saying that, I gotta thank the user LotBlind for triggering me, but he eventually said something that made sense and I figured out a new route. You see, there is a little trick which I knew about, but could not use it thanks to my old routing (because I bought it after mission 5 and there was really no use for it at the start of the levels). You can use 2 Sugar Rushes in 1 mission. Well, not really, you can still activate it only once per mission, but the intermission screen counts too. So you end a level, buy your stuff, activate the rush, THEN enter a mission. And the rush at the start of a mission lasts as usually, but then, you can use another one in a whenever you need it. Not going to go into individual level strategies, like, when to use boost, where to go first, since you can watch the video and take something from it/come up with something different (if you want to suffer). I AM DONE WITH THIS GAME. Until somebody beats me, which is unlikely I think, I am not going to play this game anymore. It has been so long, I have invested so much time into this, only to fail so many times, because of some tiny mistake OR the game screwing me over. So I am done because I can't handle it. Not going to improve the routes anymore, Fighting Force is my main game, and this was just for the keks. But I finally have it.